After three subdivisions of competition have been completed, the US women easily claim the team title for the fourth straight time at the Pan American Games. Scoring a 173.8, USA’s talented team won the gold by over seven points. Canada and Brazil both put in valiant efforts, with Canada edging out Brazil for the silver with a 166.5 to Brazil’s 165.4 for the bronze. The US men also won gold, making it the first time in 20 years that the US men and women have claimed the team title in the same year. USA Women take gold at the 2015 Pan American Games. Photo by Grace Chaui via USA Gymnastics. Madison Desch of GAGE, Rachel Gowey of Chow’s Gymnastics, Amelia Hundley of Cincinnati Gymnastics, Emily Schild of Everest Gymnastics and Megan Skaggs of Gymnastics Academy of Atlanta made up the gold medal winning team. Each gymnast performed admirably, leading to the top score on all four events. Read here for a full recap. The first of the individual events begins tomorrow with the men’s and women’s all-around finals. 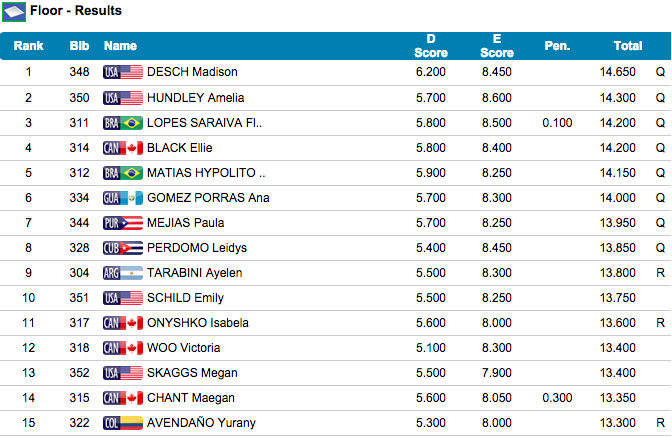 Hundley and Desch qualified in the top two spots for the women’s all-around final. Hundley, scoring a total of 57.65 put up solid routines on every event, with all four scores counting toward the team victory. She posted the highest score of the entire competition on vault, and the second highest event scores on beam and floor. Desch was brilliant on floor, posting the highest floor score of the meet, and the third highest on both bars and vault. However, she slipped off the beam while performing a high difficulty move, losing her lead and ending the meet with a 57.3. Ana Gomez Porras of Guatemala qualified in third just behind Desch with a 57.2 Separated by just 4.5 tenths, the competition for the all-around title will be fierce. The U.S. women will compete in three individual event finals held July 14-15. None of the US women vied for the Vault final. The vault and uneven bars finals will be on July 14, while the balance beam and floor exercise finals will be held on July 15. Cuba’s Marcia Videaux Jimenez qualified in the top spot with a 14.95 average score, competing two vaults with over a 6.0 start value. Paula Mejias of Puerto Rico was close behind with a 14.75 average, competing slightly less difficult vaults but scoring higher in execution. Yamilet Pena Abreu of the Dominican Republic rounded out the top three with a 14.5 average. She was able to put her feet down before sitting down on her insanely difficult Produnova (handspring double front) vault, making it into the vault final. Gowey led the bars qualifications with a beautifully executed 14.75 routine. She did not make one of her planned connections, giving her opportunity to score even higher in event finals. Hudley qualified behind her with a 14.5. Desch qualified in third, but did not advance to the finals due to the two per country rule. Jessica Lopez Arocha of Venezuela rounded out the top three with a 14.3. 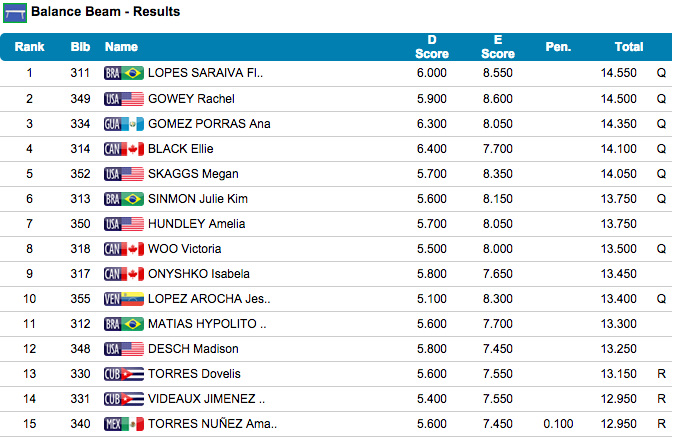 Flavia LOPES SARAIVA of Brazil edged out Gowey for the top spot on beam with a 14.55 to Gowey’s 14.5. Lopes had a one tenth edge in difficulty, while Gowey scored just a half tenth higher in execution. Ana Gomez Porras of Guatemala qualified in third with a 14.35. With just a two tenth spread, this may be a tight competition! Skaggs qualified in fifth with a 14.05 as the second US qualifier. Desch qualified into the floor finals with the top score of 14.65. She performed a beautiful executed routine that led the field by five tenths in difficulty as well. Hundley qualified in second into her second event final, earning a 14.3. LOPES SARAIVA rounded out the top three with a 14.2. Ellie Black of Canada also scored a 14.2, and with only a four and a half tenth spread from second to eighth, this may be another close final! Check out the full schedule and results on the official Pan American Games site, toronto2015.org. Full replays of events are being uploaded to the Pan American Games youtube channel. Competition will resume tomorrow with the men’s all-around finals at 12:45 pm EST. The women will take the stage at 6:50 pm EST. Competition for both events can be seen live on ESPN3. All scores are taken from the official Pan American Games site, toronto2015.org.